"Transfusion plunges you into a world originally created in 1997 by Monolith Productions. Created with the BUILD game engine (Duke Nukem, Shadow Warrior), Blood was a tour de force of horror that has yet to be matched, in which you battled minions of evil in a lightning-paced, blood splattered quest for glory. Thrill to new, enhanced special effects not seen in the original as you guide Caleb along his gory quest through a 3-dimensional world of horror. But the fun is just beginning then... When Tchernobog's Cabal has fallen, there's millions of challengers vying for your throne out there in cyberspace. Be sure to hone your skills against the enhanced FrikBots before defending your title in online bloodbaths. No need for Caleb to do all the work either - you can battle online as any identity you choose by selecting from the character library or by downloading new identities from the internet." 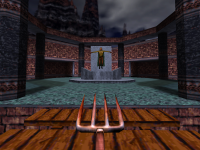 Transfusion (formerly known as QBlood, also sometimes referred to as BloodBath) is a project to recreate Blood under the Dark Places engine which is a modified Quake engine. The Transfusion project aims at recreating the Blood levels, as well as the "Post Mortem", and "Cryptic Passage" episodes from the Blood expansion packs under a truly three dimensional and free software engine. Currently the game only supports BloodBath games, though unlike Blood it supports bots using the FrikBots system. Since 2007 the project has been effectively dormant, although being free software it could be launched again pending any interested contributors. "Infogrames is prepared to give the qBlood developers/publishers a royalty free quitclaim license to use the copyrighted materials in Blood and Blood2 for purposes of this one project. We will not license the trademark Blood or any variation that incorporates the word Blood, including Bloodbath. Let me know if these terms are agreeable and the name and other pertinent contact information for the licensee." The project is allowed to use Blood textures and sounds under fair use without fear of legal repercussions, based on a quitclaim licence from Atari (then Infogrames) granted through the mediation of Joseph "knghtbrd" Carter from the Debian project. This was preceded by an endorsement by then Monolith Productions CEO Jason Hall on February 14, 2001. Some high people in the project had suggested a potential equivalent to Transfusion for Blood II: The Chosen under the free software Quake III engine (probably ioquake3); there are already recreations of some Blood II BloodBath levels included in Transfusion. The Transfusion levels and engine are free software under the GNU General Public License however most of the sounds, graphics and music are proprietary, and are mostly from Blood. These are owned by Monolith Productions and are used under permission. Transfusion runs on Microsoft Windows, GNU/Linux, *BSD, and Mac OS X. "Transfusion is our initial project, using the Quake 1 engine. Originally called just 'qBlood', it has been renamed to 'BloodBath' when we decided to switch to the Quake 2 engine in December 2001 and to make our Quake 1 game multiplayer-only. The game name has changed a second time to 'Transfusion' after we talked with Infogrames (now Atari) about the Blood trademark and copyrights... Transfusion II: Caleb's Awakening should have been our next project. Its development started in January 2003, after Transfusion first official release, but was quickly frozen (mainly because of a lack of coders). It has eventually been abandoned. Unlike Transfusion, Caleb's Awakening was based on the Quake 2 engine. The main goal was to remake the single player part of Blood, although support for the same multiplayer modes than those available in Transfusion was also planned. The team finally decided to bring the necessary changes to Transfusion for the single player support instead of restarting a complete development with another engine." The Transfusion project began as the qBlood or QBlood project in 2001 shortly after the end of the Blood Source Campaign. It started out as a project to make a BloodBath modification for Quake deathmatch. 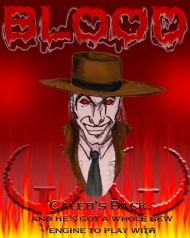 In January 2003 they decided to make a single player version called "Transfusion II: Caleb's Awaking" which would be powered by the free software Quake II engine. However they later decided to add single player functions to the original Transfusion as that would easier then starting from scratch in the Quake II engine (Transfusion later switched to the Dark Places engine fork of Quake). Transfusion also once appeared in a gaming magazine in a section discussing mods. Both version 1.0.0 was completed as well as a beta version sporting, most notably, superior models. These versions were reviewed by the Blood Wiki, Free Gamer, and Linux Gaming News in 2009. The team's main goal currently is completing the single player modes - with such daunting tasks as coding in enemies, duplicating all of the levels, and adding in all the game's minor touches. The project went into a slump between 2005 and 2007, mostly due to departing staff. At one point in 2005, a project member even attempted to solicit help from the Linux Game Tome "Game of the Month" team to acquire more contributors. In 2009 it began to heat up again and in March 2010 discussion ensued over possible making Transfusion more friendly a platform for modding, and allowing material not identical to Blood itself into the project under certain conditions, as an attempt to add new life. This was followed in April 2010 with discussions on how to get the project developed again. The project experienced some active development in 2010, with new contributors such as Liberation working on models and code. The main emphasis at that moment seemed to be the creation of a short singe-player demo to begin with, and maybe an infusion of Nexuiz code to improve the multiplayer gameplay. There has been some controversy over any single player plans, with project members citing the need for a stronger core game engine before working on it and the replacment of Quake-like gameplay and physics with aspects more closely resembling Blood. There were also plans for a monthly project IRC chat. However, on December 3, 2010 long-time project veteran Christopher Steele (aka DustyStyx) decided to leave the project, and fearing that he was the only one who had still had an interest in working on it, took down the Transfusion website. The website was later restored by William Weilep, who also took the downtime as an opportunity to upgrade the forum. "ReBUILD is a project founded in August 2000 by Timothy Hale and Mathieu Olivier, with the valuable help of Greg Enright of the BloodSource campaign. 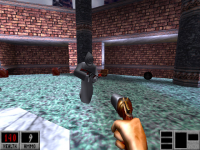 Those 3 fans of Monolith Productions' 3D-shooter Blood wanted to revitalize/modernize the editing tools for BUILD, the engine on which Blood is based, and to gather technical informations about Blood, so people would have a set of good tools to work with when the Blood source code would finally be released. At this time, Ken Silverman had just released the source code of his BUILD engine, and so many people thought the Blood source code release was a matter of weeks. Unfortunately, this release didn't happen. Timothy, Mathieu and Greg then decided to move on and founded qBlood (now known as the Transfusion Project) in March 2001. As a consequence, there isn't much activity on ReBUILD nowadays, although the project isn't officially dead. If you want to get support or information about the ReBUILD Project, contact Timothy Hale or Mathieu Olivier via the Transfusion Project." Founded prior to Transfusion, this effort produced free software tools under the GNU General Public License for manipulating game assets, graphics, sounds, maps and episodes for Blood as well as converting them to work with the then newly released Build engine source code. These tools were later used in the development of BloodCM, which later spawned BloodGDX. The Transfusion community is one of the most active Blood communities on the Internet, and was first launched on August 16, 2004. This was probably due to the forum primarily talking about a new game, Transfusion, rather than the ageing games of the official Blood series. It arose after the decline of Planet Blood and other such sites, and for several years it was the main source of developments inside the Blood community. In the late 2000s it began to decline itself however, partially due to competition from The Postmortem, but it still retains some loyal members as well as the occasional newcomer. It ranks as one of the oldest still standing Blood communities, with hopes still remaining that activity will increase further if there was ever a new Transfusion release. It is arguable that without Transfusion the organized Blood community dating back to sites like Planet Blood might have basically petered out. Recent events have included several large scale Halloween BloodBaths, including an event to commemorate the fifteenth anniversary of the release of Blood II: The Chosen that was played on and around Halloween 2013; another was held for the game's twentieth anniversary in 2018. It has also been a prominent incubator for the Halloween Fan Fiction, The Carnage Continues, Blood 2K5, Q3 BloodBath, Bloody Pulp Fiction, Extra Crispy, Blood: The Reckoning, Blood: Resurrection of Evil, Circus of Blood and other projects, as well as the Blood Wiki itself. The community member count as of January 26, 2017 was 538 and it had a total of 28714 posts. Note: this list mostly comprises of people still involved at the time the project went dormant, based on the project website. 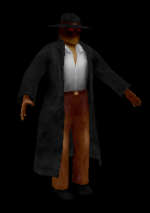 Forest Hale (LordHavoc): engine programmer and DarkPlaces engine creator. Tomasz Mizerski (Predator): lead mapper. William Weilep (Willis): lead programmer and web development and hosting. Christopher Steele (DustyStyx): 2D artist. Jeff Moore (Boss429): 2D artist. Filip Walgraef (oBe): 2D artist. Roel van Alst (Da Weezle): programmer. Sean Amato (Chingwu): 3D artist. Greg Enright (frightfan): project co-founder and initial web development. Mathieu Olivier (Elric): project co-founder and former lead programmer. Dave Turner (Darth_Linux): former project coordinator and release manager, ftp hosting. Luke Ashdown (Kazashi); 3D artist, former project coordinator and release manager. This page was last edited on 12 January 2019, at 23:27.